8 Commercial Real Estate & Properties in Ashgrove are listed in 3 categories. We have 5 Retail ShopsLease , 2 Medical and Consulting PropertiesLease and 1 OfficesLease . Fully Refurbished Tenancy Now Leasing Featuring: bull; Air Conditioned 45m2 Floorplate bull; Suit Food, Allied Health... bull; Profile + Signage to Main Road bull; Diverse Mix of Food and Fitness Tenants bull; First Level + Basement Car Parking Call Inspect Today 10 minutes from City, Bus and Rail transport, approximately 10 minutes from the CBD. For further information or to arrange an inspection contact Juma Marstella of Ray White Northern Corridor Group. High quality retail tenancies ranging from 30sqm to 123sqm in Ashgrove Central Plaza. Bustling precinct with heavy foot traffic and thousands of passing cars daily Great exposure with signage opportunities Surrounded by national tenants Ample car parking Close access to major arterial roads For more information or to arrange an inspection please contact Richardson Wrench Commercial Brisbane North. bull; High quality and air conditioned office space suited for a range of businesses bull; Ample onsite visitor parking bull; Strong pedestrian traffic bull; Glass frontage with signage opportunities bull; Join major tenants such as Westpac Bank, NAB Bank, Flight Centre and more bull; Central location with easy access and close proximity to major arterials For more information or to arrange an inspection please contact Richardson Wrench Commercial Brisbane North. Enviably positioned in the thick of Ashgrove Marketplace, this tenancy fronts Ashgrove Avenue and is located just off the busy Waterworks Road. The relocation of the current Subway restaurant business presents a rare opportunity for any kiosk centric retailers or service providers. The centre possesses an enviable tenant mix and is anchored by a high performing Woolworths. Tenancy Particulars: • High level foot traffic • Ability to close in the tenancy if required • Ample basement car parking • Adjoins national retailers in tightly held centre • Lift and escalator access to car parking The opportunity presented is incredibly rare, so don't delay inspection. To inspect, please call the exclusive McGees agents, Elliott Clarke and Gavin Moore. 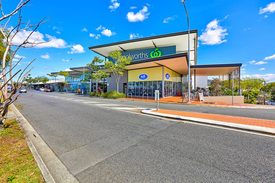 Exceptional retail opportunity within Ashgrove Marketplace, anchored by Woolworths. Tenancy Details: • 98m2 with dual shop front • Exclusive use outdoor dining • Adjoins BWS, Milk Cafe and Woolworths • Grease Trap access • Full glass shop front • Partial fitout The centre is serviced by two level car parks, lift access and transport options on Ashgrove Avenue. This tenancy is ideally suited for a food and beverage or service related retailer. For any questions or to arrange an inspection please contact the exclusive agent, Jay Whatley. This is some of the best retail/office space in Brisbane's inner North. High quality spaces available on ground level and level 1 as retail or office. Ample off street parking available for customers and staff. Spaces between 39m2 and 217m2 available High quality presentation for upmarket positioning of your brand Gross rates between $495/m2/pa and $650/m2/pa Lift servicing all levels including basement car parks Excellent mix of tenants to ensure pedestrian traffic past your business, including banking, beauty, health industry, cafe, a wide range of professionals and a flagship Goodlife Gym over two levels. These opportunities will not not last long. Incentives for businesses that will complement the existing mix. For further information or to arrange an inspection contact RW Commercial Brisbane North now!